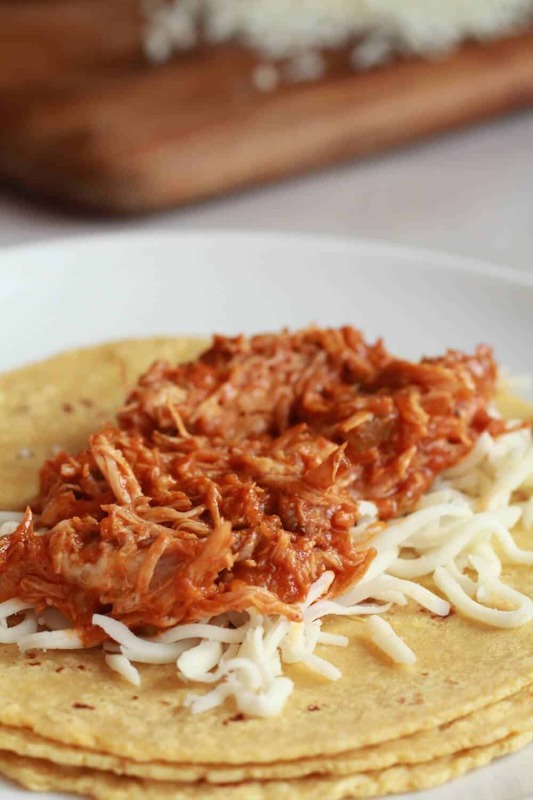 Who does not love a good taco? They’re fun, customizable and almost too cute to eat. I said almost. You can pile on the toppings (um, hello avocado and cheese), layer in the sauce and eat um with your hands. The other day, I was busy. Who’s not right? So I dusted off my slow cooker, browned some chicken, threw in some seasonings and called dinner done. Seven hours later I had one flavorful sauce and some seriously tender chicken, it just falls apart! 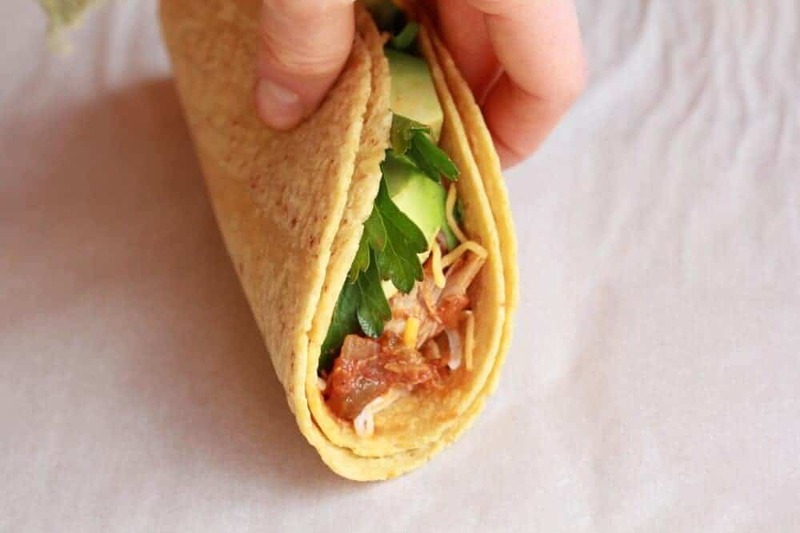 Grab a tortilla, avocados, fresh cilantro, some extra sauce and a whole lotta cheese! You now have your self one loaded taco! The best part, apart from them being ridiculously easy of course, was the smell. The house smelled so good the whole day. Like what, I don’t even know, I guess kind of like a sweet chili smell, with a bit of spice. I don’t know, but it was good! 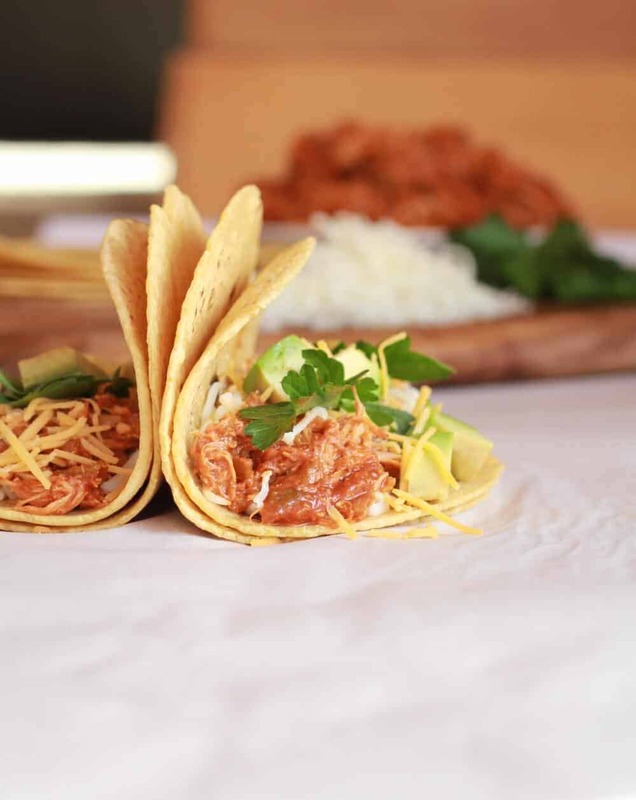 Everyone from picky eaters, to healthy eaters, to food snobs will love these tacos. They're fun, customizable and almost too cute to eat. I said almost. Coat a slow cooker with cooking spray. Combine first 8 ingredients and 1/4 tsp each, salt and black pepper. Rub half the spice mixture all over the chicken breast and thighs. Heat 2 tsp of the oil in large, heavy skillet over medium-high heat. Add chicken in batches and brown 3 to 4 minutes per side. Transfer to the slow cooker. Heat remaining 2 tsp oil in same skillet. Add onions and 1/8 tsp salt. Cook, stirring occasionally, until browned and soft, 7 to 8 minutes. Place on top of chicken, add the diced green chiles and the remaining spice mixture. Whisk together the orange juice, tomato paste, lime juice, cider vinegar, garlic, hot sauce and 1/2 tsp black pepper. Pour over chicken and vegetables. Cover and cook until chicken is tender, 6 to 8 hours on low or on high for 4 hours. Transfer chicken to cutting board and shred. Add sauce until chicken is just moistened. 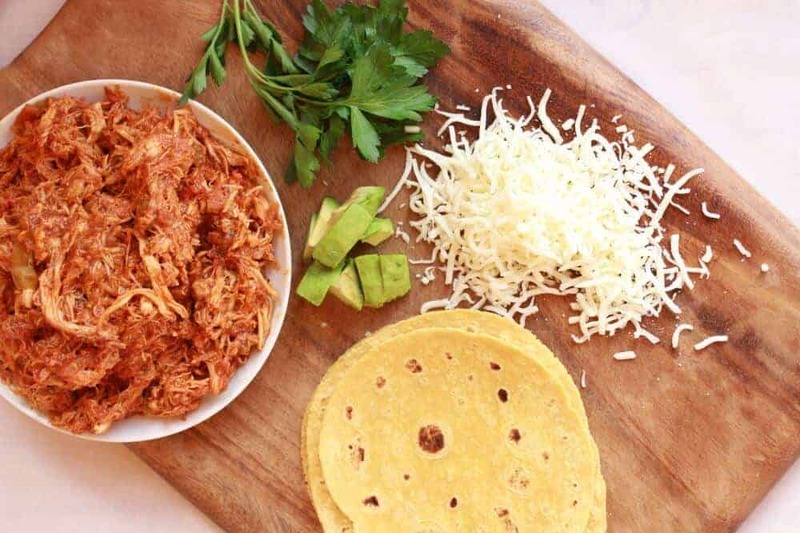 Serve with tortillas, avocados, cheese, cilantro, and additional sauce, if desired. 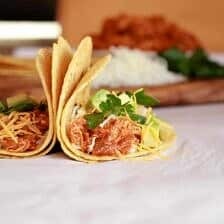 I definitely can not pass up a good taco – these sound fabulous! Thansk so much for linking up! Thanks! They are supper good! These look fabulous!!! Will definitely have to try them! Coming over from Tidy Mom….. 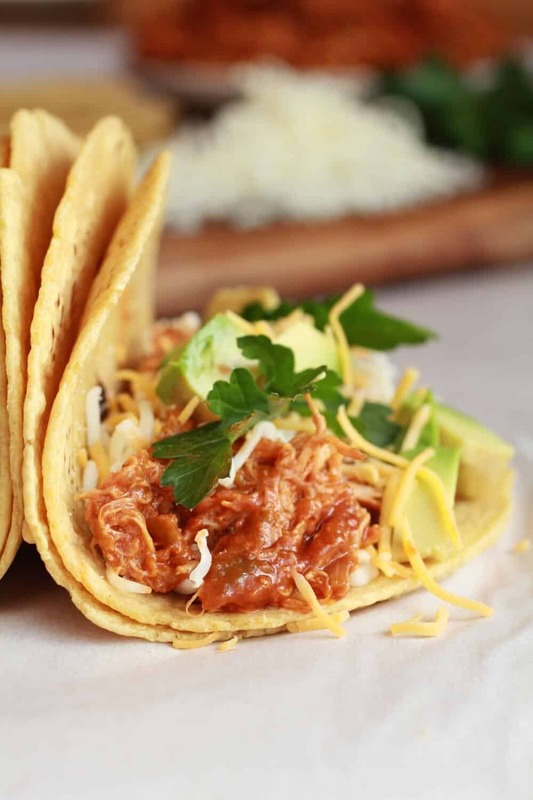 I love a good crock pot meal that I can throw together and forget until a few hours later! Already pinned, thanks! You had me at sweet and spicy. 🙂 What a perfect combination of flavors. I’m thinking this will go into my dinner rotation next week. Yum! so craving tacos now. 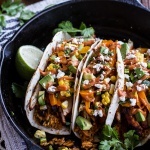 These look wonderful and I love crockpot meals. Why do the insructions call for pork. Ah, sorry this is a mistake on my part! Heading to fix it now! I have know Idea what I was thinking well I was typing up the recipe, apparently about pork! Mmmm those look really good. 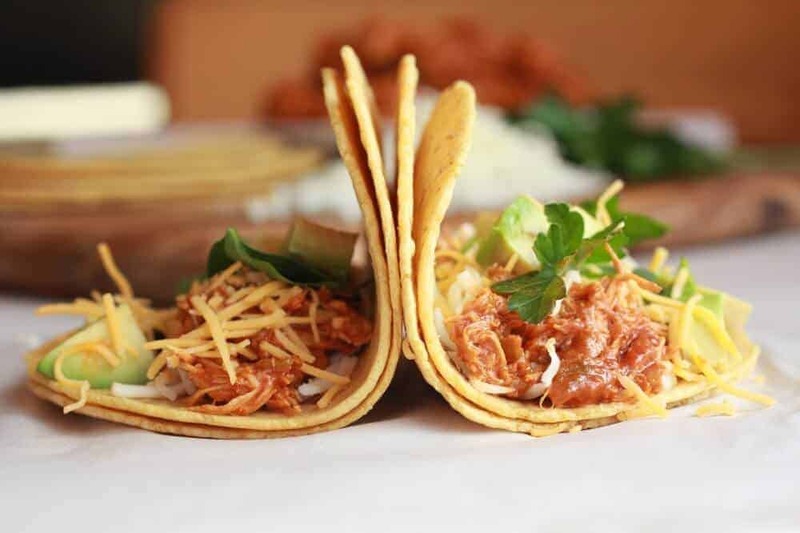 I love Tacos, and I love cooking in a crockpot. Makes for easy meals. I use mine a lot. Thanks for sharing your recipe. Pinning! Thanks for pinning! I need to break out my crockpot more! We are big Mexican fans in this house and I love the idea of the Crock Pot. Thanks for sharing at Church Supper. Have a blessed week & come back soon! Pinned and just shared on Facebook…I’m currently drooling 🙂 Thanks for sharing at Mom On Timeout! Yum! And pile on the cilantro for me! Your photos are seriously amazing! seriously where do have the time to do all these amazing things each week?! It’s called no sleep! But honestly I just try and make my recipes simple! I try though! I love the idea of sweet and sour! YUM! found you at a pinch of joy! Love the OJ with all the chiles and spices. I have to try this! Thanks for sharing on Thursdays Treasures. 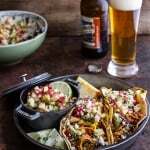 Saw this recipe on Thursday’s Treasures and immediately wanted a taco! 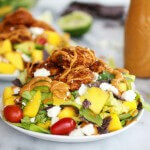 These sound delicious, and the photos are goregous! Thanks for sharing! Thank you! Thanks for clicking over! 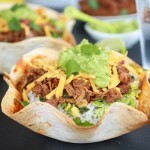 Yum we love tacos and I love my crock pot this is perfect! These look so good. I will have to try them. Doors always open (really people show up all the time!). So glad I am making you hungry! These are cooking in my crockpot right now! I can’t wait to try them. But what happens to the remaining half of the spice mixture? The other half of the spice mixture goes in the crockpot with the chicken and remaining ingredients. I know I am too late, but I hope you got it figured out and loved these!! Thanks so much for making them and I am so sorry I did not get to your comment in time! I plan on making these, so just wondering, is the can of green chilis supposed to be drained? Hey Jane, it really doesn’t matter, but I do not drain mine. Hope you love this! This is a great recipe. I think I doubled the meat called for the first time. The leftovers are killer filling for quesadillas, the spiciness mellowed with a slice or two of avocado! Yummy! Half Baked ~ You rock!! Keep the yums coming – I am yet to be disappointed. How many servings does this make? Also what size crock pot does this recipe use? How many servings does this recipe make? Also what size crock pot does it use? That is also a great way to do it! I am really glad you enjoyed this recipe Eva!